It isn’t exactly “WOW!” is it? You might as well say “That’s inoffensive yet inconsequential”. Barely a grain of anything to hold the interest can be found on the latest studio album from the once mighty Yes. 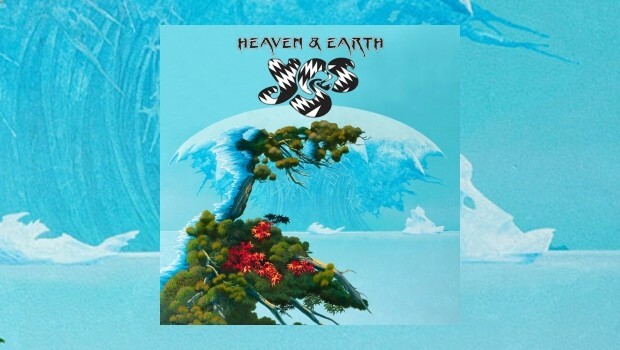 Heaven & Earth includes a smattering of nice tunes but acres of cheesy fluff and a massive black hole where the ideas used to be. This album does nothing but harm to the legend of a once fantastic studio band and there are any number of better albums that have been released by less well known artists this year and plenty of bands out there who do Yes better than Yes – ironically, one of them is Glass Hammer featuring new Yes vocalist Jon Davison – which is a great shame. The fact that Heaven & Earth was nominated for ‘Album of the Year’ by Prog Magazine even before it had been released (what?!) just rubs salt into the wound as that is nothing but pure (and no doubt paid for) marketing hype. 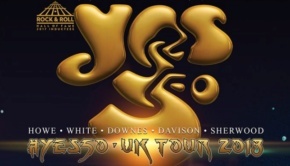 This is a very, very sad state of affairs for a fan of longstanding like myself who still has a lot of time for the live performances from which Yes could continue to make a comfortable living, touring their classic material and wowing fans with a show rooted in the nostalgia and brilliance of their best work. But to their credit they have chosen to return to the studio with renowned producer Roy Thomas Baker and give us a new album of original material, their first with Davison. This suggests that they must have something to say and a burning need to produce new music, possibly fired up by the addition of the new blood. From a creative standpoint that must also suggest that the material they have to work with has pricked their enthusiasm. Ouch. Now I’m no expert but that does not sound like the best way to produce an album of craft and quality. On the plus side, Jon Davison’s vocal contribution to Heaven & Earth is excellent and having a writing credit on all but one of the songs he clearly knows his way around an appealing melody line but I can’t be the only cynic to think that the rest of the band have used him somewhat to get this project completed, happy for him to flit around the world from one member’s home to the next working on material that they couldn’t be bothered to fully develop themselves. I’m sure it won’t be long before the call “Taxi for Mr Davison!” is heard prior to the majestic return of Jon Anderson for the band’s induction into the Rock ‘n’ Roll Hall of Fame whatnot and subsequent world tour. Just another spin on the Yes merry-go-round but this is much less than Davison deserves. But enough of the speculation and background politics of the Yes soap opera, Heaven & Earth is flat, uninspired and lacking in any real inspiration or motivation to get it done properly. If you thought 2011’s Fly From Here was substandard – I liked it, by the way – walk away now. Hell, even 1997’s Open Your Eyes – which was also a rushed and fragmented work and is generally regarded as the bottom of the Yes barrel – sounds vibrant next to this flaccid and way too light fluff. That said, it all ends on a relative high with the final track, Subway Walls, which isn’t bad but even this isn’t overly exciting. Up until then, other than the odd pretty melody I have never had to sit through such a boring Yes album so devoid of dynamics, emotion or, sadly, point. What were they thinking? Have they forgotten the quality they achieved in their best work? Are they no longer able to tell the difference? Do they actually realise the esteem in which devotees hold this band and its music? There are indeed more questions than answers when considering Heaven & Earth. The album opens with Believe Again which goes on for a bloated 8 minutes. 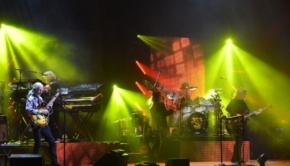 It starts with a weedy intro but Davison immediately hits a high level in his vocal performance and although the song is initially somewhat confused the chorus is very strong; melodic, catchy and memorable, a genuine grower that benefits from the classic Yes vocal sound achieved by the harmonising of Davison and Chris Squire. I suspect that Davison wrote the melody whilst Howe came up with the tricky but sub-par mid-section that just pulls the whole track off balance. Howe and Geoff Downes don’t have much of note to play and it feels like the decision was made to “Yes” the track up a bit but they had no idea how to do it, a common occurrence on several of the tracks where it feels like lacklustre instrumental contributions have been shoehorned into songs that don’t require them. Believe Again is all about the chorus, a pleasant diversion with little substance beyond the melody. An edited version would no doubt make a good single and maybe grab some attention but as with most of the song ideas here it is stretched out of all proportion rendering the result unsatisfying. Yes have clearly set out to write a pop album but forgotten that pop songs work best at around the 3 minute mark. The Game suffers from another tedious Howe introduction and should instead have opened with Downes’ more insistent keyboard line. It has its moments with a good main theme and a bit more energy than elsewhere but overall it doesn’t work as it should and again the editing scissors should have been out to excise the faffing about and reduce the running time by half. Less is often more and the result would be something much more worthwhile, there is just too much repetition with little in the way of progress. Steve Howe provides a few brief flashes but they are not up to his usual standard and the whole is disappointing. The rest of the album is a mixed bag to say the least. On the plus side is the acoustic guitar and piano flavoured To Ascend which is very pretty but sounds like it should have been saved for a Jon Davison solo album rather than Yes. It’s a decent slow tempo pop song and doesn’t outstay its welcome as much as the others although it would still benefit from a bit of pruning. The sedate and upbeat pop of In A World Of Our Own makes for a light and happy toe-tapper with a ’60s vibe akin to some of the material on the Squackett album, but why add the portentous organ near the end? It is completely out of place and goes nowhere. Davison’s Light of the Ages has a well realised melody line but plods along to a conclusion that is way too far off with no build up or climax. In fact the ending is so drawn out and uneventful that you could use it as a sleeping aid. Howe’s It Was All We Knew is upbeat acoustic pop with a pretty chorus that is again pleasant but nothing more. If it turned up on a compilation of obscure ’60s songs no one would be surprised as it wouldn’t seem out of place. The instrumental mid-section tries to spice it up. It fails, but that almost goes without saying on this dismally unexciting album. Step Beyond has to be singled out as it is indeed a step too far and beyond a joke; the nadir of the whole album. It really is awful with poor lyrics and a ridiculously annoying keyboard part plus another failed attempt at “rocking” it up from Howe. For me this is right down there with Man In the Moon from Open Your Eyes as the worst Yes song ever, it plods along in a cringeworthy and embarrassingly happy-clappy way for, again, far too long. Dreadful. At long last we get to the aforementioned Subway Walls. By now it is far too late to save the album and there really isn’t any point to it as it is so at odds with what has gone before but it is head and shoulders above the rest. The keys driven orchestral intro from Downes is good but not quite epic enough, although it does act as a mini-overture and there is some energy in the music. Bass and stabs of guitar opens the next section with Davison again a class act. There is much more of a live sound to this one and it sounds different to the rest of the album to me. The main theme is strong and it is certainly an enjoyable listen after the bland and insipid nonsense that makes up most of the rest of Heaven & Earth but it is still timid and tame in comparison with previous Yes long-form pieces. There is an almost jammed instrumental section with Downes’ fine Hammond work duelling with Howe – some decent instrumentation at last – and Geoff’s stately piano chords lead into the final section which features lovely contributions from Howe in a baroque style build to a proper climax. All of the band sound good on this one and it works very well, a decent stab at something interesting and if it were the first track on the album I’d be looking forward to what else the band had to offer but as the closer it is just too little too late and underlines just how poor the rest of this massively underwhelming disc is. As a Downes/Davison co-write they should receive a lot of credit and maybe work together again. If Yes were to consider another studio album with this line-up this would be a good place for them to start from. It’s not the easiest thing to take in from the download copy I’ve been given for review purposes but Roy Thomas Baker’s production doesn’t sound too bad at all on the whole but I don’t understand why better quality digital copies aren’t distributed for this purpose. I also don’t have a problem with the mixes by Yes alumnus Billy Sherwood that have been panned in certain circles. I don’t rate downloads and would like to hear this album properly from CD to see how it is supposed to sound but I sure as hell won’t be buying it to find out. I’m certainly not in the “No Jon Anderson, no Yes” camp, his absence is not an issue and from the start I’ve been impressed with Jon Davison’s skills and attitude. In fact he’s the only one who comes out of this with any credit, his vocals throughout Heaven & Earth are pure quality and the most gratifying element on display. Very much in the vein of Anderson, he also brings a similar cosmic edge to the songs and his performance. As such he is a perfect addition to Yes but he is no JA clone and brings his own style of cosmic airiness, his lyrics possessing the hippy qualities of Anderson’s work. 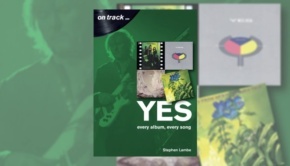 Unfortunately, the material largely lets Davison down and I sense a general limiting in abilities, desire, time, money – although no doubt the studio and production were expensive – but this is not a Yes album that I will return to often; it plods where Yes used to fly. Almost everything on Heaven & Earth is twice as long – at least – as it needs to be and as an album of light and fluffy pop songs don’t expect wild flights of instrumental fancy. For me the whole is completely unsatisfying and not what I want from Yes. It’s as if the rest of the band let Davison do most of the groundwork and then Baker cobbled it all together, the bulk of the material is low grade solo album fare that is simply a travesty when held against all the things that made Yes great in the first place. Hats off to Davison for his performance and for having the balls to take this on, but the songs are translucently thin; there are no dynamics to speak of, nothing new and no attempt to create anything of long-term value. Some of the melodies are sweet and there are some toe-tapping moments but there’s no grit or excitement, no sense of scale and despite aiming for heaven the music stays resolutely rooted to the ground. If this is the last release from Yes then it is a confused, sad and depressing way for them to bow out. 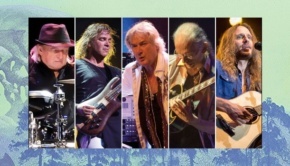 Alan White and Geoff Downes almost appear missing for most of Heaven & Earth, making up the numbers and adding little of note. Chris Squire’s backing vocals are as good as ever but his bass work is limited. Steve Howe is more visible but the results range from cheesy to inconsequential with very little of interest. This is all such a shame and so unnecessary. These guys collectively have about 200 years experience in the music industry and you’d think that they would know a thing or two about quality control but they’ve long since proven that not to be the case. The material should have been saved for various solo projects but we all know that they aren’t going to sell as well as something with the ‘Y’ word on the front so can we blame them? Well yes, I think we can. I’m fed up with being fleeced for sub-standard material by one of my favourite bands but I won’t be duped again. I used to buy Yes albums on release unheard and without a second thought; not any more. I’m resigned to the fact that no new Yes material will ever take me to the otherworldly places of yore. They’re still great live but if they want to make a studio statement of any note it needs much more planning, time and attention to detail to realise properly. This album does not inspire at all which is what the best Yes music does. Invest with caution or if you’ve got more money than sense as there are far more worthy causes than this to spend your cash on.